When the government announced the introduction of the Building Schools for the Future campaign in 2004, it was to have a massive effect on the construction industry. Over the next few years one hundred and eighty schools across the country will be refurbished and rebuilt in order to create adaptable and appealing environments to learn in. One of the first of these is the brand new development of Failsworth School just outside Oldham. 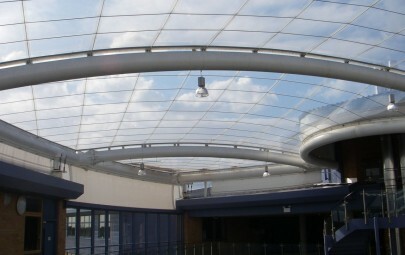 Based on the a common theme within the BSF schools, architects ACP and contractors Kier Regional opted to introduce a single ply ETFE roof to provide a weatherproof street space which still felt like an outside area. 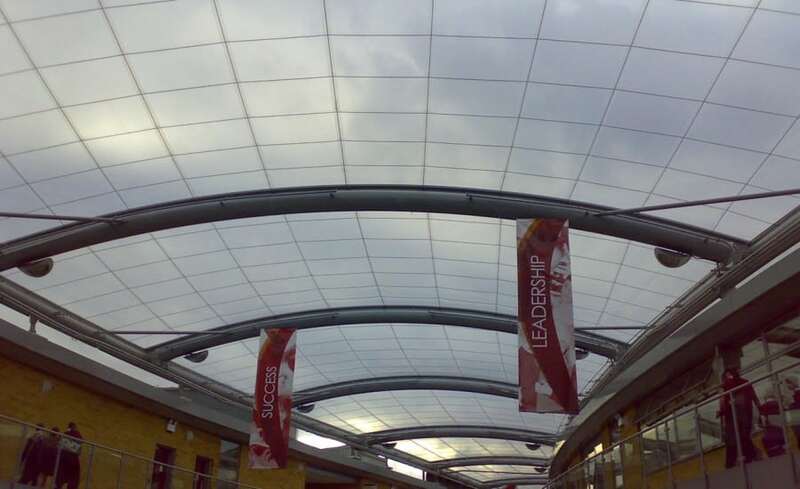 For this purpose, ETFE was the perfect choice, not only lightweight and durable but its high transparency allows the same light transmission as glass. 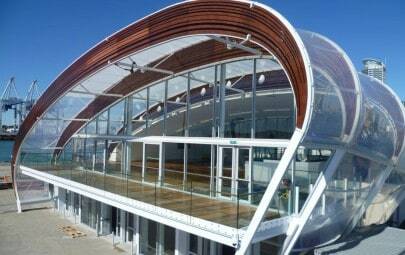 The original ETFE contractor ran into difficulties and so was replaced by Architen Landrell who took over the scheme part way through design stage and worked closely with Kier and the steel contractors to complete the project successfully. 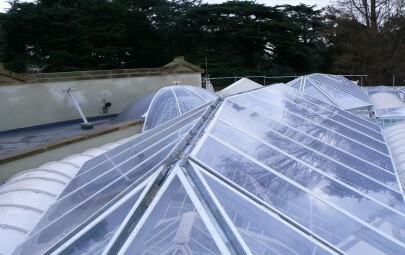 With the steelwork already in place and the flatness of the proposed design causing problems, Architen Landrell worked hard to redesign the ETFE panels and cable support net to make the roof a workable construction. As construction of the school was well underway when the Architen Landrell team arrived, our schedule was extremely tight and left very little room for movement or mistakes. 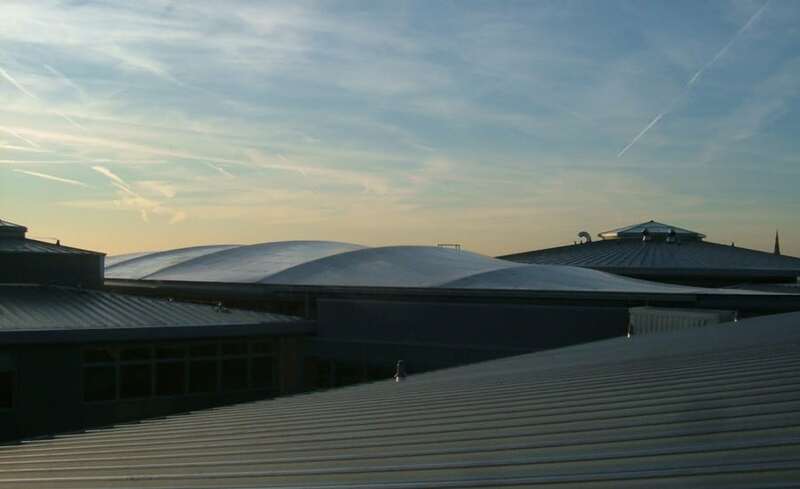 Only through hard work and drawing on the companys extensive experience in this industry was the ETFE roof finished in time for the school to open in February 2008. The school is very satisfied with the finished scheme. 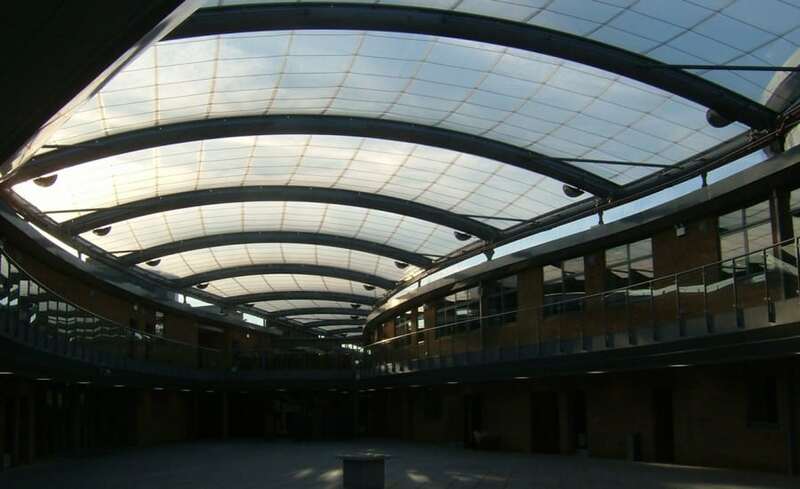 The ETFE roof provides an outdoors/indoors space which can be used for commuting between classes, break times or even as a classroom space to provide as much versatility as possible!